Projections show that in 2050 global population will have increased to 9 billion people and 70% more food will be needed. 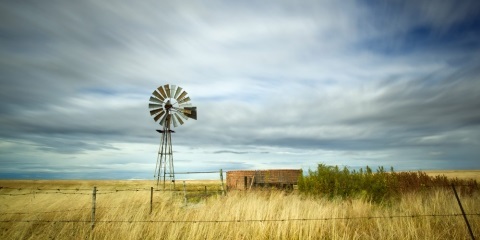 Over 70% of global water availability is used for agricultural production. Electricity generated from water, hydropower, provides 20% of the world’s electricity and is the main energy source for more than 30 countries. The increasing demands on energy, food and water resources has led to increased discussion on the inter-linkages between these sectors and how they impact each other. For example, energy is needed for water and wastewater treatment as well as distribution to consumers. Water needs to be stored for farmers to be used for irrigation of crops. Management of watersheds is important to sustain sufficient flows for hydropower production, as well as providing cooling water for thermal power plants. 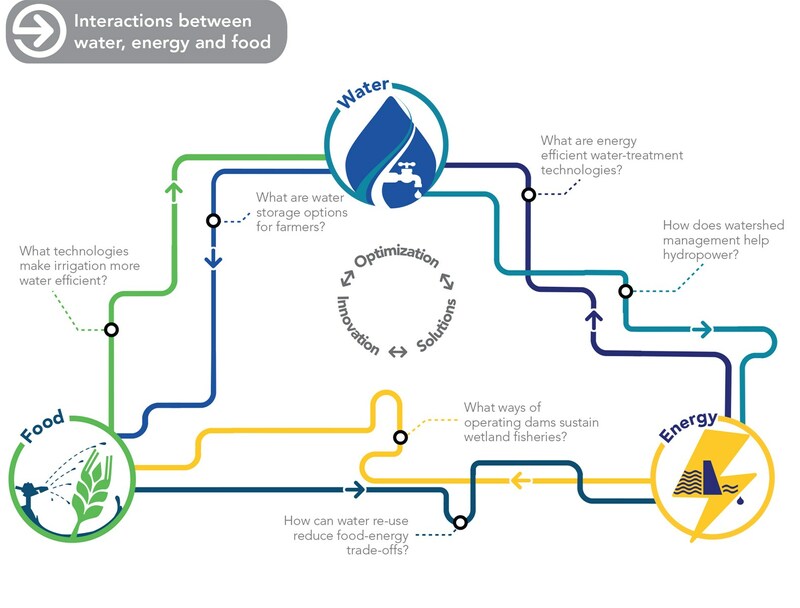 To address such competing water needs for the water, energy and food nexus means exploring opportunities to optimize water infrastructure and technology for multiple purposes. In response, the International Water Association (IWA) and the International Union for Conservation of Nature (IUCN) have launched the Nexus Dialogue on Water Infrastructure Solutions, aimed at building partnerships to lead transformations in water infrastructure planning, financing and operation. The Dialogue provides a forum for sharing experiences, lessons, tools and guidelines on how portfolios of water infrastructure and technologies can address the challenges of the nexus. The Nexus Dialogue was an idea that grew from interactions leading up to the Bonn2011 Nexus. It was recognized that there was increased interest in investing in water infrastructure in different parts of the world because of concerns around climate change, food security, population growth and need for adaptation. It was also recognized that in addition to water infrastructure we need a broader set of options and technologies that work well across the water, food and energy sectors. For example, investments in water reuse to provide an additional water source for industry and agriculture in water scarce areas. The types of infrastructure and technologies include engineered approaches such as dams, reservoirs, canals and irrigation systems. But it also includes ecosystems and watersheds that act as ‘natural infrastructure’: mangroves that buffer against severe storms, floodplains that absorb flood waters, forests that stabilize soils, lakes and wetlands that clean and store water. Well-functioning and healthy natural infrastructure supports the performance of engineered infrastructure. For example, the maintenance of catchment forest areas can prevent increases in sedimentation that can affect downstream reservoir capacity. The Dialogue is the first step in catalysing thinking on nexus solutions and provides a unique opportunity to move from discussions about the existence of the water, energy and food nexus to forming new partnerships that can actively address the nexus in a localized context. Along with educating and advancing thinking on infrastructure and the nexus, the Dialogue will provide the opportunity to catalyze a number of partnerships and proposals that enable follow up discussion to determine how to apply analysis of tools, and how to move to the second stage of designing and setting up solutions around nexus issues. There is a rich array of experience and practical knowledge across professional fields including farming, energy-production, natural resource management, and engineering. However, the challenge is actively bringing these together to provide active learning and knowledge exchange. The Nexus Dialogue on Water Infrastructure Solutions will bring together the key actors required for building new investments in innovative water infrastructure and technology that address the interdependencies of water, energy and food. Interested organizations and individuals are invited to take part in the dialogue and share their experience in optimising the existing multiple approaches of man-made infrastructure and technologies including dams, embankments, and wastewater systems, and nature-based infrastructure, including rivers, wetlands and forested hill slopes. To learn more and contribute visit http://www.waternexussolutions.org. This blog was originally posted on IWA Water Wiki. To read the original blog, click here.